The districts of North 24 Parganas and South 24 Parganas came into existence in 1986, carved out of the erstwhile 24 Parganas district in the Gangetic delta of West Bengal. The undivided district derived its name from the number of Parganas or fiscal divisions (in British India) in the tract of land known as the Zamindari of Calcutta, to the south of Calcutta (Kolkata), which was ceded to the British East India Company in 1757 by Mir Jafar, Nawab Nazim of Bengal. 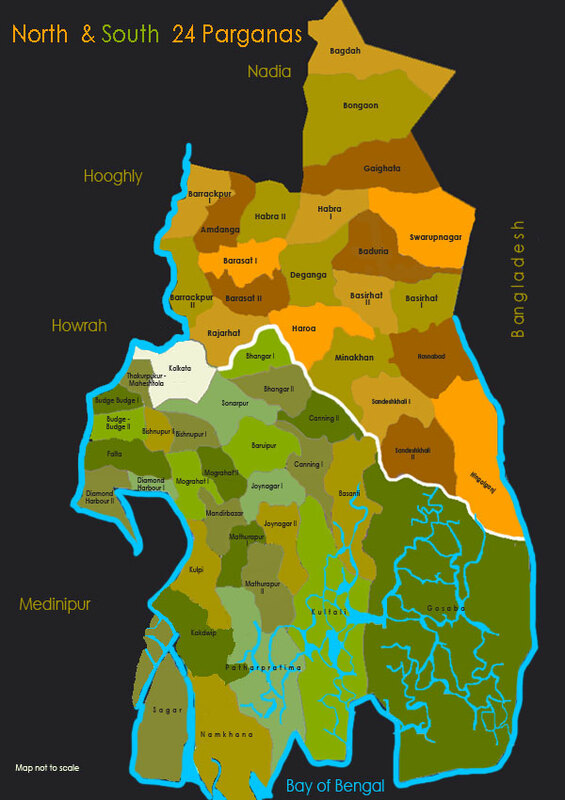 The districts of North and South 24 Parganas are enclosed by Nadia on the north and the Khulna Division of Bangladesh on the north and east, the Bay of Bengal on the south and the river Hooghly on the west. The present headquarters of North 24 Parganas is Barasat while Alipur, once a southern suburb of Calcutta (Kolkata) and now a neighbourhood in the city, is the headquarters of South 24 Parganas. North 24 Parganas is the most populous district in the state and second most populous district in the country. References to this portion of the Gangetic delta are found in texts like the Mahabharata, the Raghuvansha and the Puranas. It is also indicated in Ptolemy’s map of 2nd century CE as part of the ancient Gangaridai kingdom, which is considered to be the same as the Vanga Janapada (kingdom) of ancient Bengal. In the 7th century CE, the district may have formed part of the Samatata kingdom, which was probably also another name for the Vanga kingdom. The Samatata kingdom lay at the outskirts of the Gupta empire (CE 320-550) and archaeological excavation at Berchampa village in what is now North 24 Parganas proves that the area came under its cultural influence. It is also assumed that the region came under Pala rule in the 10th century CE. In 1495, the poet Bipradas Pipilai wrote Manashavijay, based on the Manasha Mangal Kavya epic, where he mentions the sea voyage of a merchant Chand Saudagar through riverside towns in this region. The ruler of the Sunderbans in the latter part of the 16th century CE was Pratapaditya, one of the Barah Bhuiyan (the twelve feudal lords who declared their sovereignty from the Mughal Empire) kings and a military genius. Such was his power and prowess, that not only did he quell the Portuguese and Arakan pirates who had infested the Sunderbans, he also defeated, one after the other, the imperial Mughal generals sent after him. But in the early years of the 17th century, the Mughals managed to penetrate the recesses of the Sunderbans and captured him. Preferring death to dishonour, Pratapaditya took his own life. The Dhaali Naach or shield dance is said to have originated during his reign. Though the English received only zamindari rights (right to collect rents) after 24 Parganas was ceded to them, by 1765 had full proprietary rights over the region. Under Henckell, the Judge and Magistrate of Jessore, reclamation work started in the Sunderbans. Tribal immigrants (mainly Oraons and Mundas) from Chhota Nagpur were brought in to reclaim the land and large areas were converted into fertile rice fields. His objective was to introduce a body of peasant proprietors and to enable this, he granted leases of land and assisted in their development and in the welfare of the people in various ways. So great was the gratitude of the people, that they named a market station Henckellganj after him (now corrupted to Hingalganj) – because they believed that his name would be enough to drive off the tigers that infested the place. The Sundarban constitutes the largest delta in the entire globe formed by way of sedimentation of the river Ganga & its tributaries and is a UNESCO World Heritage site. It is one of the largest reserves for the Royal Bengal tiger. The main rivers of the district of North 24 Parganas include the Ichhamati, Jamuna, Kalindi, Raimangal, Bidyadhari and Hooghly. The Ichhamati, the longest among these rivers forms the border between India and Bangladesh. The distributaries of the Ganga which criss-cross South 24 Parganas include the Hooghly, Saptamukhi, Thakuran, Mridanga Bhanga, Matla and Gosaba, with many rivers changing their names at different parts of the course. Barring Kolkata, North 24 Parganas is the most urbanized district of West Bengal and agriculture is no longer the mainstay here. Because of the proximity to Calcutta, the colonial capital, education spread to both these regions very early on. According to the 2011 Census, the population of North 24 Parganas is 10,009,781 of which 42.73% lives in rural areas, and the average literacy rate is 84.06% (highest in West Bengal). The population of South 24 Parganas is 8,161,961 of which 74.42% lives in rural areas and the average literacy rate is 77.51%. Population is lowest in the Sunderban region which is home to the majority of the tribal population and scheduled caste communities that inhabit the two districts. The people here live in physically vulnerable circumstances. The area is cyclone prone, monsoonal and low-lying, with many settlements located alongside the waterways and coastline. In spite of soil salinity and other difficulties, agriculture is the prime occupation. During the agricultural lean season, people resort to fishing and collection of prawn seeds, risking their lives from man-eating tigers and crocodiles. Collecting the rare mangrove honey today is allowed only during special times and in selected areas. Transport and communication in the Sunderbans are not well developed, and many villages do not have domestic electricity. The hardships of daily existence have given rise to fraternal feelings and non-communal traditions. Members of both Hindu and Muslim communities worship the same gods and goddesses, Gazis and Pirs. Bonbibi (the lady of the forest) is a guardian spirit of the forest venerated by all residents. She is called upon mostly by honey-collectors and woodcutters before entering the forest for protection again the attacks from tigers. It is believed that the demon king Dakkhin Rai (Lord of the south), an arch-enemy of Bonbibi, actually appears in the disguise of a tiger and attacks human beings. He too is worshipped. The narratives of Bonbibi are found in texts named as the Bonbibir Keramoti (the magical deeds of Bonbibi) and the Bonbibir Johuranama (glory to Bonbibi). These texts comprise two major episodes, her battle with Dakkhin Rai and the narrative of Dukkhey, a poor shepherd boy and form the theme of the folk drama particular to this region, Bonbibir Pala. Other folk deities worshipped in the region, irrespective of religious beliefs, include Sitala (godess of small pox), Manasa (goddess of snakes), Manik Pir (god of cows), Satya Pir or Satyanarayan and Ola Bibi (cholera). The Pirs are credited with supernatural powers and their tombs are places of pilgrimage. Altars for Gazi (Gaji) Pir – lord of wild beasts, are very common in the Sunderbans. There are several folk forms associated with this Pir – Gajir Gaan (ballads about this warrior hero) and Gajir Pata or Pot (scroll paintings extolling his deeds). With the majority of the population of the Sundarbans being tribal, tribal festivals and the Jhumur songs and folk dances that go with it, abound. Elsewhere in the district, many traditional folk performing forms like Baul-Fakir, Kobigaan, Torja, Manasha Bhashan songs and Dang Putul Naach (rod puppetry), have been retained, in spite of being in close proximity to the metropolitan centre of Kolkata. Folk crafts in the form of terracotta dolls and votive objects, cane basketry, mats and shola sculptures are also to be found. A famous festival takes place annually at Gangasagar (Sagar Island), at the confluence of the river Ganga (Bhagirathi/Hooghly) with the sea. Thousands of devotees come to visit it and take a dip to wash away all the sins on the occasion of Makar Sankranti, a harvest festival, held in mid-January every year. A big colourful fair, called Sagar Mela, is organised on that occasion.